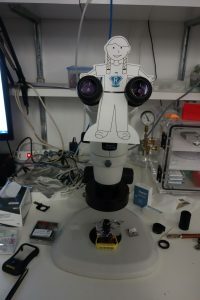 Flat Rosie works on Ultrafast Dynamics in the Zurich ETH Lab! 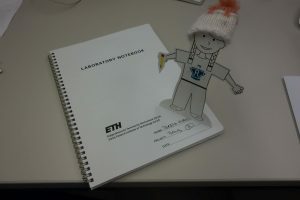 Flat Rosie just got back from her first international trip to the ETH lab with the Swiss Federal Institute of Technology! Rosie visited the Ultrafast Dynamics Group. She learned all about how very short laser pulses interact with materials. By short, we mean really short. Tens of femptoseconds short! Ultrafast Dynamics means Ultrafast Lasers. 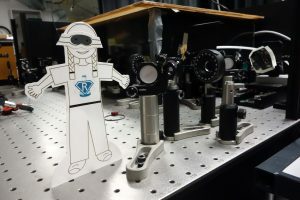 Flat Rosie aligned her set up in the ultrafast dynamics laser lab. She set up mirrors and aligned the laser beam to prepare for her experiment. Rosie is not yet very tall, so she has to be very careful and set up all the optical components at a low height. This is so that the laser beam never hits her eyes! To be extra sure, she is wearing laser goggles to protect her eyes from laser light. well when there is a lot of humidity in the air. Every once in a while Rosie had to check the air that flows through the laser is dry enough. She can tell by checking the color of the Drierite reservoir. Drierite is blue when dry and turns pink when it becomes wet. 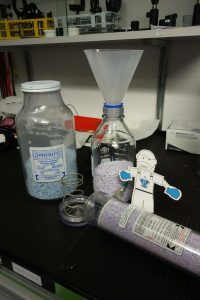 Rosie is replacing the pink Drierite in the reservoir by new blue Drierite from the bottle. When exchanging Drierite it is good practice to use gloves and a mask, to avoid breathing or touching Drierite dust. Rosie is prepared the samples for her measurements. Looking through the microscope was not easy, but she made it to the top! After a hard day’s work, Rosie is taking notes of all that she has done. This way she won’t forget any of the details of her experiments, and she will be able to write accurate reports. And since the Fall is arriving in Switzerland, Rosie is starting to gear up for the cold! Rosie was careful to be safe during her trip to the ultrafast dynamics lab. Can you spot all the ways she practiced good lab techniques? Can you find 4? Defining the Kilogram, Resolving Conflict.